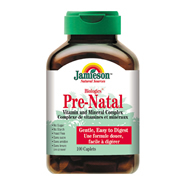 Jamieson Pre-Natal Vitamin and Mineral Complex is nutritionally balanced for the requirements of the expecting mother and supplies her fetus with the proper nutrients for healthy development. The chelated minerals in this complex allow for easier digestion and assimilation with the necessary requirements of vitamins and minerals to ensure optimum health. Each caplet contains: 1000 IU Vitamin A Acetate, 1800IU Beta Carotene, 200IU Vit D, 150mg Vit C, 30IU Vit E, 3mg Vit B1, 3.75mg Vit B2, 10mg Vit B6, 10mcg Vit B12, 22mg Vit B3, 10mg Vit B5, 30mcg Biotin, 1mg Folic Acid, 200mg Chelated Calcium, 100mg Chelated Magnesium, 20mg Chelated Zinc, 30mg Chelated Iron, 1mg Chelated Copper, 25mcg Chelated Chromium, 5mg Chelated Manganese, .15mg Iodine (from Kelp). Prepared in a natural source nutrient base of Rutin, Hesperidin, Acerola, Rosehips and bioflavanoids (conutrient vitamins C complex factors), peppermint, chamomile, and digestive enzymes of Bromelain, Papin, Amylase, Lipase and Cellulase.